Up to 50 "exceptional" students are to be given financial support in the form of fellowships set up to honour Professor Stephen Hawking. 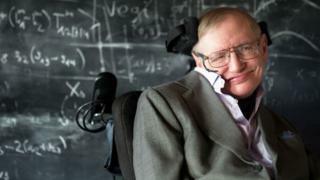 The renowned physicist died in March, at the age of 76, after a long battle with motor neurone disease. Ten UK Research and Innovation Stephen Hawking Fellowships will be awarded for the next five years in the fields of maths, physics and computer sciences. The professor's family said it was a "great tribute to his life in science". Science Minister Sam Gyimah said: "[They] will allow exceptional graduate students in maths, physics and computer science in institutions across the UK to take their work even further." The funding will allow the students to continue their work in any UK institution for up to three years. "I can think of no more fitting tribute to this great man than to support the next generation to push the boundaries of knowledge of the laws that govern our universe," Mr Gyimah added. The fellowships were created in consultation with the professor's family, who said: "Our father knew the value that fellowships could provide to advancing research. "He was very interested in the development of new talent and devoted much of his career to his teaching roles. "We are thrilled that these fellowships will be named after him and see this as a great tribute to his life in science." Prof Hawking died in Cambridge on 14 March and thousands lined the streets of the city for his funeral later that month. His ashes will be interred between Sir Isaac Newton and Charles Darwin during a service of thanksgiving for his life at Westminster Abbey in London on 15 June.